The tracks during the 2015 Outdoor MX Series have been much rougher than recent history through the first three rounds. 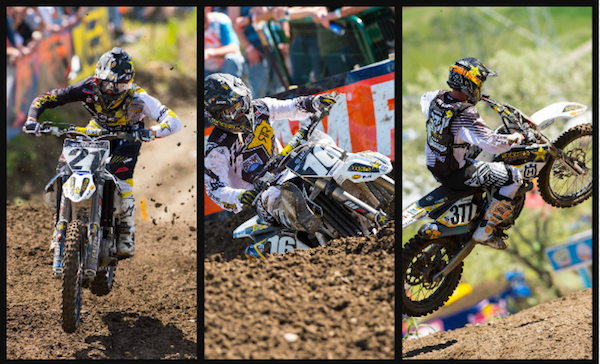 Thunder Valley was quite possibly the most rutted course ever seen by most onlookers and riders alike. The ruts were as deep as the bikes and seemed to cover every square inch of the course. One thing was for certain, the difficulty level was high, but in the opinion of many, it may be too much. Motocross is certainly a tough sport and the rougher the track the better to separate top riders but the racing thus far has been for the most part without many good battles or passing and some think that is the cause. The field is as stacked as ever with lap times being pretty close throughout the top ten so maybe that is playing in as well with everyone going at a similar rate of speed. The interesting thing last weekend however was the inconsistency of lap times in the motos. Every rider was experiencing a five second variation minimum from one point to another so that definitely points to the track's challenging surface, yet passes were still rare because mistakes were so common. The two most difficult tracks for Jason Anderson are Thunder Valley and coincidentally next weekend's Muddy Creek. Every rider has favorite tracks and places that they are not too fond of. Usually the latter are the locations they struggle most at. There will always be throw away weekend's but you have to overcome that to the best of your ability if you want to be in a championship hunt. Jason did that in his first moto but was unable solve the riddle of the ruts in moto 2. His first moto, his start was good and he held on and fought the best he could. If he wasn't surpassed in the final turn of the final lap, he would have finished 5th which is his every moto minimum goal average throughout the series. The second moto just wasn't his best. His start wasn't as good and neither was the moto. All he can do however is learn from the experience and try to apply it to the future, and next week for that matter. Jason Anderson: "My weekend in Colorado was not the greatest. My first moto I got a good start and was running up front and ended up falling out of the top 5 on the last lap. In the 2nd moto I was trying but I just kept getting passed. You can't blame the track but I think it's the reason I wasn't riding to my full capability. I don't think I was overriding the track, I just couldn't figure it out. I felt like I was going at 20% speed even though I was trying. I'm just going to go back this week and try and ride better next weekend and keep at it." Christophe Pourcel is continuing along with very consistent results from one weekend to the next through the first three rounds. In fact his finishes have been so steady that he has been 8th overall every weekend, putting him in a tie for 8th in points. He is still following along the goal path set forth by himself and team owner Bobby Hewitt, but is looking for improvements soon. The plan is to be putting together top 5's by round 5 or 6 and he is not far off, but needs to find just a little more. Christophe Pourcel: "This morning I had top 5 speed then the track got really, really rutty and was a little sketchy. The riders in front of me and behind me from 3rd or 4th place to 11th or 12th were pretty much just following each other. We're all fighting the track, it's so rough and we're all just going so slow. I think we are all surprised at how slow we are going. The tracks coming up should be better. At this point we haven't really seen any good racing and have just been following each other. It's been so rough that we don't wanna crash and there are so many ruts that are as deep as the bike. My 2nd moto start was a lot better, I was around the top 5 and I just kind of stayed in that front group trying to find my groove. Overall it was an ok weekend, I wish I was in the top 10 in the first moto but I got a bad start and was fighting the roost and rode tight. We finished in the top 10 overall again which is the plan but sooner than later we need to improve. I'm not too far off of the guys in front of me so I'm learning and once my speed gets there it will be better racing for me." Zach Osborne's recovery from his crash at Glen Helen was nothing short of remarkable. He dislocated his shoulder with two laps to go in the final moto after a big crash. Luckily he was able to put it back in himself quickly to avoid further damage and inflammation. Surprisingly it did not bother him much aside from a little soreness in his tricep from being stretched. Osborne has always been one to compete in many facets of motorcycle racing from Supercross and Motocross to GP's and Off-Road. Maybe his versatility helped him a lot on Lakewood's extremely technical course. He was on fire all day in both practices and each moto. His starts were much better as well and he quite simply just put it all together. Zach was able to finish on the podium in both motos and collect a 2nd overall. If the way he rode last weekend is any indicator, he could be on the podium every week through the last 9 rounds. Zach Osborne: "Today was good. My speed was good in practice, I was 5th in the first session and 3rd in the second. In the first moto I got a decent start with a top 5 and put myself in position to end up 2nd in the moto. I've been struggling with my first motos and just struggled in general so far this year and and that finish gave me a good bit of confidence going into the second moto and it was a good feeling. I got a better start and almost pulled the holeshot coming out 2nd. I was a little slow to get going in the first couple laps and I went back to 4th or 5th, then I kicked myself into gear and went forward to 3rd where I stayed. My bike setup was good and I enjoyed today. It's been a long time since my podium at A1 and there have been a lot of struggles since then so this feels really good." Next weekend the series heads farther east to Tennessee's Muddy Creek MX. Humidity is going to start coming into play and that in itself will begin to separate those who train the hardest. Anderson will need to get through his final tough track of the year before moving on to his favorites. He has been training in Florida so the humidity could be a benefit to him. Pourcel will continue to improve and try to work his way closer to being top 5 in both motos. Osborne carries his confidence over and will look for a repeat performance on a similarly rutted difficult track.